Beautiful NE beach, I returned here again since family visits in the 1970’s. Same uncrowned ocean front, restricted parking keeps the number of people controlled, clean, well supervised with attentive lifeguards, beautiful at low tide with large sandbars. Sad to see the extensive and ever-growing erosion which is depleting the beach/dunes. Great waves for kids and adults; and low tide also great for babies and kids of all ages. We actually couldn't find a place to anchor behind Nauset Light beach, the currents around the break were scary for our little boat. So we'd beach across the break and it was beautiful and deserted. Mostly shore break on a steep beach, there were a few spots where at low tide it was flatter with a good break for body surfing. Those cute seals are now in Nauset harbor so we were a little scared of sharks and had little luck with the blues and stripers. The beach is very clean and is monitored by lifeguards, which makes it very family friendly. There is a nice, gradual ramp leading down to the beach, which eases the load of coolers and heavier items. Stunning beach! Get up early to make sure you get in because they control the admissions. The temp bathrooms are actually really nice. Sad to see the storm damage and erosion from 2018 storms but the path down is actually easier to navigate than the old stairs. Great beach. The beach was great and very close by! Get there before 10am for optimal space! We visited on cold and rainy day, but the weather just enhanced this beach's wild, natural beauty and the proximity of the picture perfect lighthouse was icing on the cake. This was our favorite beach since it had limited parking. With limited parking it means you have to wait for a spot some days ( we waited 15 at the most one day) but less people on the beach. Life guards were always on watch, great waves and clean. If you are going to go to the national seashore beaches frequently look into a season pass for $60. Our pass paid for itself in three days and saved us a lot of money for the week. Atlantic side bigger waves sand dunes colder water just a beautiful beach. Nauset Light Beach is where you will find the Nauset lighthouse, a magnificent sandy beach, beautiful sunrises, and impressive post-storm waves. Tip: go during lower tides if you are a beachcomber. Go to the Salt Pond Visitor center to get a beach fire permit. Permits are available first thing in the morning on a first come first serve basis and must be reserved 3 days in advance. Lots of space since the parking lot is not huge. Ride your bikes in order to cruise right in any time of day. This beach has great waves, plenty of beach to walk and is not crowded! The setting by the lighthouse is very nostalgic to us. The parking area is limited, but we like to go to the beach early in the morning, so that is not a problem. This is a beautiful beach with a rapidly eroding dune. Limited parking keeps the beach from being overcrowded. The lot usually fills up by 9:30-10:00 but if you come a little later you can wait in line for a space to become available. The beach walk down to Coast Guard Beach and back during low tide is beautiful. Make sure you take the lighthouse tour on Tues. or Wed. in the late/afternoon/evening. My dad started my love affair with Cape Cod when I was 10 years old, over 60 years ago. We stayed in N. Truro and made a visit to Nauset Light Beach. The waves were large and stole my heart. Every time I've been on the Cape since, I've made a visit to this beach. The amount of erosion that has occurred is amazing, even requiring moving the light house back from the shore. This year we walked a mile or more down the beach, being enthralled with the waves, the birds, the shells as well as the beautiful white sand. We've been there in storms as well, including the day after Hurricane Sandy in 2013. The power of the ocean in that time was enough to impress anyone. I love Nauset no matter the weather or season. I still need to see it in winter and hope to do that before long. Beautiful, clean, and visually magnificent. Although the steps provide a good workout to get on and off the beach, it's well worth it! You can walk for miles in either direction, spotting the seals and, once away from the lifeguarded area, there is space to sit and stare. The children enjoyed the delightful waves, the adults enjoyed the cool breezes. Very quiet and clean and you can bring your dog. The beach is relaxing for adults with plenty of activity for the kids. The change in tide throughout the days makes boogie boarding to skim boarding fun for all. There is always a nice breeze and it is never to hot even on 90+ days. Having the life guards there as well is reassuring. Part of National Seashore- Dog friendly! Loved walking along the shore and seeing the seals. Could view seals and very nice beach for families. Seals galore! We had an amazing time swimming with seals everywhere. 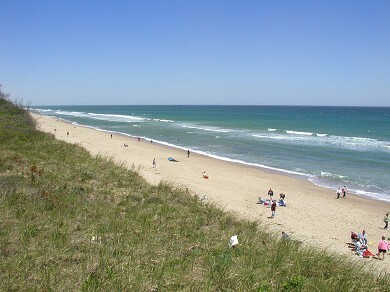 It is impossible to pick one favorite beach, truly, in this area, but our most memorable experience was at Nauset Light. Have loved this dramatic beach for decades. Nature at its most beautiful! The view as spectacular as you walk down the steps from the parking lot to the sand. As a treasured part of our National Seashore, the beach is kept in pristine condition. Have not been to it the past few years as the surf there would be too rough for the little ones now in our family. But when they grow older, it will be my joy to introduce them to Nauset Light Beach. It was just great, clean, neat, showers, whales, seals just like on a book. Wonderful sea, surf and sand but get there early! This beach is less crowded than others in the area, probably due to limited parking. Easy to escape the usual crowed beach. Clean, nice surf. Beautiful with big waves. Clean and so much fun.